We have all played with magnets. A pair of magnets by itself makes a wonderful toy. Today's magnets are even better than the best ones I remember playing with as a child. At toy stores and Radio Shack you can get flexible magnetic strips of plastic that can be cut into shapes with scissors. You can also get cheap and brittle ceramic magnets, stronger Alnico magnets, and even the new super strong rare-earth magnets. These are made of neodymium-iron-boron or samarium-cobalt, and are very powerful. At the end of this section I will list some sources I have found for good or cheap (or good and cheap) magnets. Some particularly nice tiny ones can be found in our catalog. Through mail-order surplus houses you can get large neodymium-iron-boron magnets of incredible strength. For about five dollars each you can get magnets that will hold paperback books onto your refrigerator, or drag each other around a two-inch thick table, one on top of the table and one hidden underneath. I once entertained my guests and several waiters at a restaurant by mysteriously moving the stainless flatware around the table. People are not used to the effects of powerful magnets. They are amazed even when they can see what you are doing. Because of their high strength-to-weight ratios, neodymium-iron-boron magnets seem to be little affected by gravity. Small ones can be placed on either side of a nose and will stay there until the wearer laughs so hard they slide upwards against gravity and snap together. Temporary earrings are also popular. Handle larger magnets with care, since they will pinch hard enough to cause blisters if they are separated only by small bits of skin. They are also easily capable of erasing the magnetically stored information on credit cards, computer floppy disks, and cassette tapes, so take care when selecting a pocket for them. If you are showing magnets to a very young person for the first time, there are several tricks you will not want to forget. Use some large cheap ceramic magnets from Radio Shack or a toy store so they will not be easily lost or swallowed. Show how they attract and repel each other. At Radio Shack you can get some donut-shaped magnets that can slide over a pencil. The child can stack several so they each repel, forming a magic spring. A magnetic compass placed near the arcs of powder will align itself with them, following their curve as you move it around. Several magnets under the paper will create interesting shapes in the iron ore above. Paper clips, pins, keychains, and other bits of ferrous metal will alter the shape of the ore as they become temporary magnets under the influence of the permanent magnets. Stroke a bit of iron or steel (such as a pin or a screwdriver) across the magnet. Show how this makes a new magnet, and how the new magnet can attract other bits of steel or the iron ore. By placing the new magnet under the paper, you can show with the ore that this magnet is not as powerful as the original. Heat up the pin or screwdriver to show how heat destroys the magnetism. Place two magnets under the paper, separated by a paper clip or other small bit of iron. Make sure each magnet touches the paper clip. Now when you sprinkle the ore on the paper, it forms a much smaller arc of powder. This shows the effect of a magnetic flux concentrator (the paper clip) which narrows (and thus strengthens) the force between the two magnets. These simple observations form the backdrop for the rest of this section. There we will show some effects that are not so simple or obvious, and yet are simple extensions of the properties of magnets that we all learned as children. Building a magnetic heat engine. I originally built this toy using a Canadian nickel coin. Canadian nickels are made of pure nickel, unlike U.S. nickels, which contain so much copper that they are not magnetic. You can build the toy with the nickel or with the Radio Shack rare-earth magnet. The rare earth magnet will work a little better because it loses its magnetic properties at a lower temperature, and thus the toy can use a candle instead of an alcohol burner for its heat source. Some particularly nice tiny rare-earth magnets can be found in our catalog. This heat engine is very simple. We suspend a small piece of magnetic material at the end of a pendulum. A large magnet is placed near the pendulum, so that the small piece of material sticks to the large magnet. The magnet should be close enough that the material never rests at the bottom of the pendulum's swing, but instead jumps up to the magnet. A candle is placed under the material, so the flame just touches it. The candle flame will heat up the magnetic material until it loses its ability to be magnetized. Gravity will then pull it away from the magnet (and thus away from the flame). The magnetic material will cool down a little bit once it is away from the flame, and regain its ability to stick to the magnet. The magnet will then pull it up into the flame, and the whole process repeats. All the parts can be found at Radio Shack, but if you want to build the engine using a Canadian nickel, any hardware store will have the other parts you need. 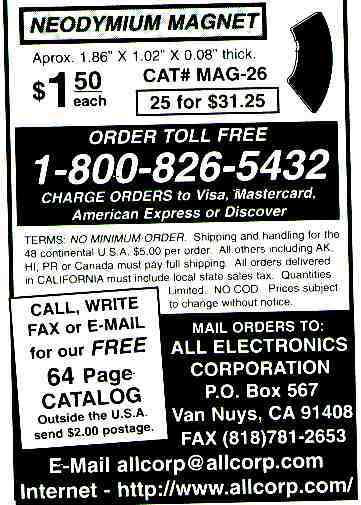 You will need some copper or brass wire, a large ceramic magnet (the cheap kind that Radio Shack sells for about a dollar), and a candle. We want the pendulum to swing back and forth only, so we use two wires to hold it up. Cut about a foot of wire and wrap the center of the wire around the large magnet. Then form the two ends into small loops and bend them up to form the support for the pendulum. If you are using the rare-earth magnet for the pendulum's weight, it helps at this point to demagnetize it by holding it in a candle flame. You can stick it onto a coat hanger and hold the magnet in the flame until it falls off. This will prevent the magnet from jumping onto the large ceramic magnet while we adjust the pendulum. Wrap another foot of wire around the nickel or the rare-earth magnet that will form the weight for the pendulum. Form the two ends of the wire into loops that slip into the loops of the pendulum support. Make sure that the pendulum weight is just close enough to the magnet that it rises to it when the pendulum is vertical. The wires of the pendulum and its support should be long enough that the weight can fall away from the flame and hang vertically when it is demagnetized. With the pendulum stuck to the large magnet, position a short (lighted) candle so that the flame just touches the weight. You may need to shield the flame from drafts so it remains steady. The flame will heat the rare-earth alloy until it loses its ability to stick to the large ceramic magnet. It will then fall away, and swing a few times as it cools. When it is cool enough to be magnetized again, it will rise and stick to the magnet, where the flame will again heat it up. If the weight still touches the flame when it has fallen away from the magnet, adjust the pendulum's supports a little so that the weight rests a little farther away. If the weight is so far away that the magnet cannot pull it back up once it is magnetized, adjust the supports to bring it closer. Be careful when adjusting the supports, since they may be quite hot. Also be careful to move the candle so as not to burn yourself on the candle flame. When the engine is adjusted just right, it will settle down to a predictable swing, often taking only one swing to cool enough to stick to the magnet again. It will run as long as the candle burns. If you have chosen to use the Canadian nickel, you will need a heat source better than the candle. A small alcohol lamp or fondue pot burner will do nicely. You may have to make the pendulum support wires longer to make room for the lamp. The heat engine works because of something called the Curie effect. The Curie effect describes how a magnetic material loses its ability to stick to a magnet when heated above a certain temperature. This temperature is called the Curie temperature, and varies with the material. The Curie temperature for iron is about eight hundred degrees Celsius. The Curie temperature for the inexpensive ceramic magnets is also quite high, which is why the candle flame or even the alcohol lamp does not affect them. The Curie temperature for the Canadian nickel is lower, about 631 degrees Celsius. This temperature is within range of the alcohol lamp, and almost possible with the candle. The Curie temperature for the Radio Shack rare earth magnets is 310 degrees Celsius, and the candle can reach this easily (not only because of the lower Curie temperature, but because the magnets are so much smaller than the nickel that they heat up faster, and have less unheated surface area). I have tried Ronson lighter flints, which also have a Curie temperature within easy range of a candle. The combination of their small size and low Curie point makes them stay above their Curie point too long. The magnet and the flame have to be close together for the engine to work. When the flints are close enough to the magnet to overcome gravity, they are close enough to the flame to rise above their Curie point. Other designs have been tried successfully, involving placing the flints on a wheel and using a soldering iron as a heat source. A magnifying glass could be used to focus the sun on the flint when it is touching the magnet, without heating the flint when it falls away. Experiment with other designs. There are many possibilities. Here are the construction details. More about magnets (the scientific part). It is fairly simple to think about the nails becoming magnets and aligning themselves in the magnetic field. It is also fairly simple to think about them as dominos that "fall" in line with the field. But which is the real explanation, and how would either of them happen? Both explanations are correct. Magnetic fields exist because somewhere electrons are moving. In the nails, the electrons in the iron atoms are orbiting the nucleus, and each electron is also spinning on its axis. Most materials are not strongly magnetic, because their magnetic poles (caused by spinning electron) are either randomly oriented, or they pair in opposite directions. If the electrons in an atom (or a molecule) create equal numbers of north and south magnetic poles that cancel each other out, the atom has no magnetic poles. If you bring a magnet near such an atom, the magnetic field causes the electrons in the atom to move. Moving electrons create a magnetic field, and the field they create is opposite to the original magnetic field. The atoms move away from the magnet. Materials that act this way are called diamagnetic materials. The effect is very weak, even in bismuth, which is the most diamagnetic material. If the electrons in an atom do not create canceling magnets, the atom has a north and a south pole. Normal room temperature causes these atoms to bounce around, and their magnetic poles are randomly oriented. If the atoms are inside a magnetic field, some of them will align with the field. Others will have too much energy and will still bounce around. The amount of energy depends on the temperature, so the colder the atoms are, the more of them will align with the field. Materials that act in this way are called paramagnetic materials. Paramagnetic materials are attracted to magnets, but the effect is weak unless the temperature is very low. Paramagnetic materials also exhibit diamagnetic effects, but the paramagnetic effect is stronger unless the temperature is very high. Aluminum and platinum are paramagnetic. In four elements (iron, nickel, cobalt, and gadolinium) the magnetic poles of the atoms stay lined up even at temperatures that thoroughly randomize the poles of other elements. These elements are called ferromagnetic. In the four ferromagnetic elements the magnetic effects are caused by the electrons in the inner orbits. They would align with their poles opposite except for a principle of quantum mechanics called the Pauli exclusion principle. This principle (very loosely interpreted) says that electrons cannot occupy the same space unless they have opposite spins (which means opposite magnetic poles). Two atoms in an element like iron might share an outer electron. This electron will try to align the poles of the inner electrons to be opposite the outer electron. This makes the inner electrons have the same orientation. The inner electrons are thus all aligned the same way, and contribute the magnetic field. In many paramagnetic materials, the atoms pair up with their north and south poles in opposite directions, canceling each other out. These materials are called antiferromagnetic. Chromium and manganese are antiferromagnetic. Some materials, called ferrites, are similar to antiferromagnetic materials, but consist of two different magnetic components, one of which is stronger than the other. This makes them act like ferromagnetic materials, and they are attracted to magnets. The iron ore we have been using is an example of a ferrite. It is a mineral called magnetite, and the natural magnet lodestone is made out of it. The name for this configuration is ferrimagnetism, after the ferrites. Ferrites find many uses in electronics, because they are magnetic, but do not conduct electricity like iron does. Just as electricity travels through some materials better than others, magnetism travels with ease through some materials, and has more difficulty traveling through others. The ability of a material to conduct magnetic flux is called the relative permeability of the material. It is measured relative to the permeability of air, which is assigned a permeability of one. Iron and steel have relative permeabilities between 100 and 9,000. Ferrites have relative permeabilities between 50 and 3,000. The relative permeability of a material can be thought of as the ease with which a material can be magnetized. The higher the relative permeability, the easier it is to magnetize a material. The lines of force of a magnet, as a group, make up the magnetic flux. The stronger the magnet, the more lines of force it has, and thus the more magnetic flux it has. A typical household magnet has between 100 and 1,000 lines of force. One line of force is called a maxwell. Materials with high relative permeability allow more lines of flux inside them than does the air around them. The flux is thus concentrated in the material. The measure of concentration of flux, measured in lines of force per square centimeter, is the gauss. One gauss is one line per square centimeter. The earth's magnetic field measures about .2 gauss. The superconducting electromagnets used in magnetic resonance imaging range from 5,000 to 15,000 gauss. When you held the nail close to the magnet, the lines of force of the magnet flowed more easily through the nail than through the air. Just as water seeks the path of least resistance, the magnetic flux sought out the highest relative permeability. Because there would be less resistance if the flux flowed through the entire nail lengthwise rather than through a small part of it crosswise, there is a force on the nail that tends to line it up with the lines of force of the magnet. This is the force that makes it "fall down" parallel to the lines of force. At the same time, the nail is magnetized, and its poles are attracted to the opposite poles of the magnet. Measures used in permanent magnets. What makes a good permanent magnet? We want a magnet that has a strongly concentrated magnetic field. We also want a magnet that will stay magnetized. To understand how we measure a permanent magnet's strength and permanence, it is helpful to picture how we make a magnet. We start with a piece of iron or another ferromagnetic material. We will assume that it is not magnetized when we find it. To magnetize if, we place it in a magnetic field created by another magnet. We will place ours in a field created by an electromagnet, so we can vary the strength of the field and see what happens to the iron. When the field strength is small, the number of lines of force concentrated in the iron is also small. As the field strength rises, more of the tiny magnets in the iron (called domains) align with the external field. The number of lines of force in the iron rises with the field strength. This continues until all the magnets in the iron line up with the external field. At this point we say the iron is saturated. It cannot hold any more lines of force. As we raise the external field strength, we see no further increase in the number of lines of force in the iron. Suppose we now start reducing the external field strength. The heat inside the iron at room temperature jostles the tiny magnetic domains inside, and some of them readjust so they do not align with the external field. But some domains stay stuck, aligned with the field. When we completely remove the external field, these stuck domains are left, and we have a permanent magnet. Suppose we now reverse the external magnetic field, and start gradually increasing its strength. At first the stuck domains resist turning around to align with the external field, and the number of lines of force concentrated in the iron changes only slowly. As the external field gradually overwhelms these stuck domains, they flip over. Eventually the external field is strong enough to flip them all over, and the iron is saturated again (but the poles are now reversed). If we graph the number of lines of force in the iron against the strength of the external magnetic field, we get a graph that looks like a fat S.
We call the magnetic flux density that remains in the iron when we remove the external field the remanence. We call the strength of the external field needed to demagnetize the iron the coercive force. What we want in a permanent magnet is a high remanence (measured in gauss) and a high coercive force (measured in oersteds). 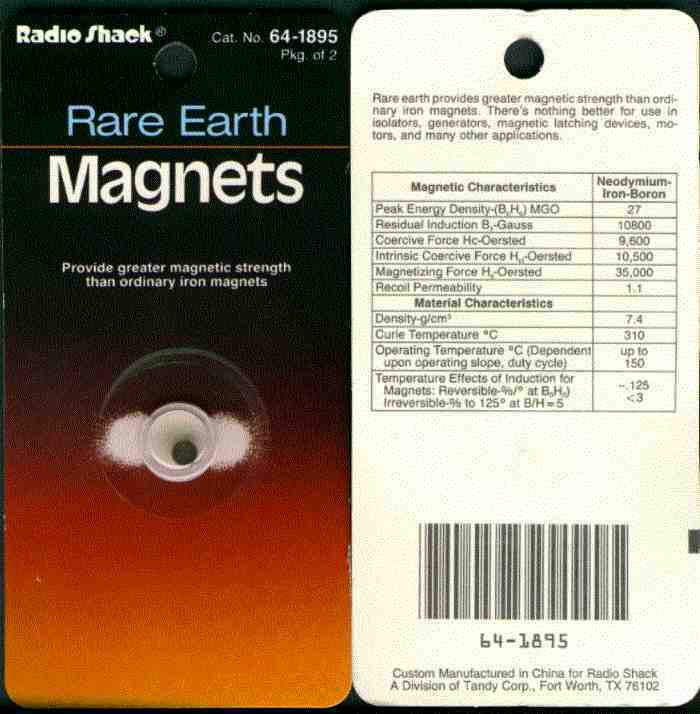 Radio Shack sells small magnets made from a neodymium-iron-boron alloy that have very high values for remanence and coercivity. The package lists the remanence (which they call by its other name, residual induction) of 10,800 gauss. The coercivity is 9,600 oersteds. Another measurement used to describe permanent magnets is the strength of the external field when the material is saturated multiplied by the number of lines of flux in the material at saturation. This number is the energy product, or the peak energy density, and is measured in gauss oersteds. The Radio Shack magnets have a value of 27 million gauss oersteds. These magnets could be dangerous if they weren't so small. They are less than a quarter of an inch in diameter and about a tenth of an inch high. For more information on measuring magnets, see Calculating the strength of a magnet. Next: Suspending a magnet in mid-air. Because some of our readers were having difficulty finding good sources of small neodymium-Iron-Boron super magnets, we have obtained a quantity of some very nice gold-plated tiny magnets for use in the Curie-effect heat engine and the magnetic suspension project. For more information on magnetism, see the Recommended Reading section.